Today is the LAST DAY for the $5000 giveaway! We are giving it away this month to ONE LUCKY person! 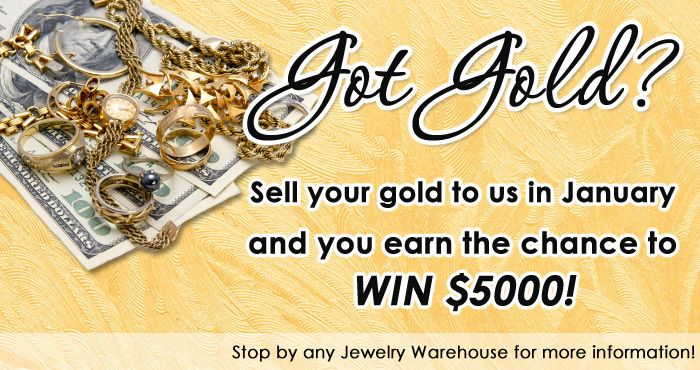 To earn the chance to win, all you have to do is sell your old or unused Gold to us! Stop by today at any Jewelry Warehouse location and you will be surprised at how much your old or unused gold is worth! All locations except West Columbia are open until 7 pm! The West Columbia store is open until 6 pm. Jewelry Warehouse always gives you more for your gold! This entry was posted in Gold Buy Contest, Jewelry, Jewelry News and tagged gold buy, selling gold, selling gold with jewelry warehouse, win $5000 when you sell your gold. Bookmark the permalink.